UBC Library is hosting a first ever GIS day at Koerner Library on November 20. The sessions include instructional hands-on tips as well as research-based presentations. For more information or to register visit the links below, or the GIS day website. Maps show how we understand, quantify, and model our environment; It is the cumulative process of mapping and map making – data collection, filtering, aggregation, and abstraction – that make up cartography. Find out how you can share geographically-based activities using Google Maps and Google Fusion Tables. This session will provide a hands-on introduction to basic map creation and introduce you to other aspects of the software. Learn about the movement ecology of African elephants and how GIS can act as a powerful conservation tool. Mark will provide an overview of Esri’s ArcGIS products, including ArcGIS Server and 3D CityEngine. The fourth annual UBC Library and United Way Spelling Bee drew a crowd of over 100 spellers and a total of 17 teams. 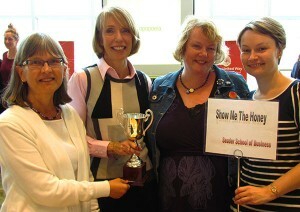 During a sudden-death overtime round, Jan Wallace, head of the David Lam Management Research Library stepped to the mic to represent the David Lam Library team “Show Me the Honey” against the UBC Ceremonies and Special Events “Lexicons” – and brought home the first victory for a UBC Library team. The winners of the 4th annual Spelling Bee. Trish Rosseel, Acting Head of the Humanities & Social Sciences Division at Koerner Library, lead the event as MC and challenged competitors with words such as graupel, appoggiatura and foofaraw. The cross-campus team competition to raise awareness for the United Way was broadcast live on CiTR, UBC’s campus-based alternative programming radio.